On a Balmy warm supposedly winter’s evening in South London, Back 2 Da Future Music CEO, Kennedy Mensah, brought Music Publishing to life In conjunction with the Pempeople (People Empowering People), project, Peckham. 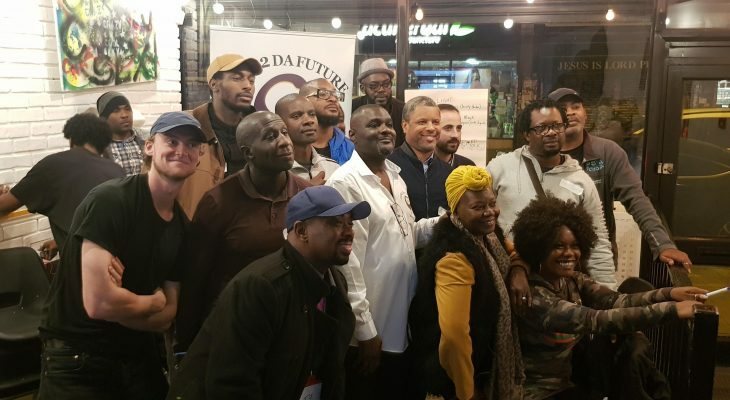 Kickstarted in Accra, Ghana earlier in 2018, the 10thAnniversary seminar tour had seen Kennedy Speak during the Summer, at The London and City Universities respectively as part of International Reggae Day and a further Reggae Copyright Breakout Session. “It was coming up to our tenth Anniversary and we wanted to mark the milestone.” Glowed the 20 year Publishing veteran in Peckham, continuing. “We knocked around a couple of ideas like throwing a party, doing a sampler or putting on a showcase and settled on spreading the KNOW-ledge through a series of workshops throughout the year. We started in Ghana during Independence week and continued back here in London over the Summer. We shall be in Jamaica in November for a couple of events around the Jamaica Music Conference at UWI (the University Of The West Indies). And all things being equal we shall be doing at least one more speaking engagement and another workshop in London, as well as in the North of England by the end of the year”. Hosted by Kennedy and his wife Izzie, (Company Secretary and Royalty Administrator), the Peckham cohort made up of an assortment of Singers, Rappers, Producers, Managers and other music practitioners from entry level to seasoned professionals filled the pop up space to the brim. “The passion for music was very evident in the room and the keenness of the audience to learn how to earn from the music that they create was nothing short of inspiring”, observed Izzie. Brought together through a combination of Social Media, Eventbrite and word of mouth, the session which included interactive role play was dotted with anecdotes from his near 30 years’ experience in the music business, a fact not lost on at least one attendant. “One of the things I enjoyed most was the Open discussion and real world examples about publishing” wrote one Singer/Producer. The evening started with an introduction to the facilitator and then continued with a history of Publishing for the lay person and ended with an exercise in the creation of an EP – replete with accompanying Royalty splits with guidance from the sometime DJ and compere in his Prezedent persona. From the feedback received every one of the attendees advised that they would recommend this workshop to others with comments ranging from “I Need A Publisher” to “We need A Part 2” via “It was very easy to understand and very entertaining”.